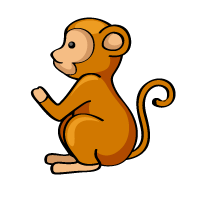 The monkey is the ninth symbol in the Japanese Zodiac. Monkeys were believed to be the wise of mountains and messengers of God. This sign represents “cleverness” and “curiosity”. Monkeys are clever, inventive, flexible, and decisive. Although they are perfectionists and do not hesitate to use every trick to achieve their aims, they tend to be preoccupied with a short-term gain and fail to see the whole picture. Have excellent skills of negotiation. Tend to make a snap decision. Monkeys are compatible with rats and dragons. If these three come together, it generates a great positive power. Monkeys also have a mutually beneficial relationship with snakes. Tigers are the least compatible with monkeys. In Japanese, a monkey is “saru” in romaji, and is written as “猿” in kanji. In the Japanese Zodiac, however, it is written as “申”.